Iwo Jima was the one of the bloodiest battles in Marine Corps history. 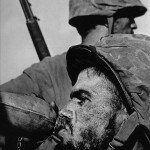 Of the 70,000 marines that hit the beach, 6,281 never left alive and a further 19,217 were wounded. Yet more than a quarter of all the Medals of Honor, given to Marines in World War II were for this epic clash. Up to World War II, every generation of Marines had to fight for the Marine Corp’s right to exist. So when the Navy Secretary, James Forrestal saw the first flag raising on Mt Suribachi and knowing the cost in blood to get it there he said to Marine commander, Holland “Howlin’ Mad” Smith “the raising of that flag on Suribachi means a Marine Corps for the next 500 years.” The battle, and the greater Pacific campaign, is remembered by this photo taken by AP photographer Joe Rosenthal. In 2014 an article in The Omaha World-Herald published an investigative report based on the research of two people Stephen Foley, from Ireland, and Eric Krelle, an Omaha-based historian. They determined that due to the equipment and uniform of the men in the second flag raising photo John Bradley couldn’t have been in the shot. 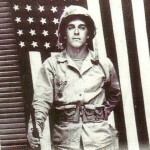 In 2016 after looking at the research the son of John Bradley and the author of “Flags of Our Fathers” thinks “that he now believes his father is not actually in it.” A Marine investigation into the matter determined that John Bradley was in fact not in the second flag raising photo and that it was actually, Harold Schultz. After he said that, it was clear he didn’t want to talk about it,… He was a very self-effacing Midwestern person. He was already sick, and died two or three years later. Iwo Jima or Iōtō (硫黄島) translated means sulfur island. 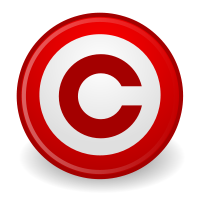 On June 18, 2007 it was renamed Iōtō its pre-war name supposedly at the request of its former island residents. The name Iwo Jima actually came from a mispronunciation of the Japanese Kanji for the islands by the Japanese military. So the Kanji for the island (硫黄島) has never changed just how it is pronounced. The volcanic island of Iwo Jima, is only about 8 square miles (21 km²); it is nothing more than a black chunk of lava, covered in ash, thrusting out of the ocean. The island has little in the way of greenery and is covered with stinking sulfur hot springs and volcanic vents. Marines who lived through the invasion described Iwo Jima as hell on earth. It looked like hell, and the entrenched Japanese defenders made it one. General Kuribayashi planned a brilliant and unique defensive plan for Iwo Jima. Instead of defending from above ground where superior American naval and aerial bombing could cause extensive Japanese causalities, Kuribayashi planned to fight the Americans from underground. Over 1,500 rooms were dug out of the volcanic rock. Connecting the rooms were 16 miles of tunnels. Before the Japanese died each soldier was told to kill 10 Americans before they themselves were killed. 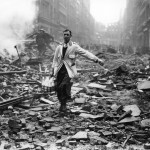 Japanese doctrine called for no surrender and no survivors. 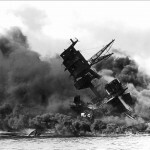 After days of bombardment on February 19, 1945, battleship guns fired again signaling D-Day. The naval guns stopped for a few minutes at which time bombers struck the island and then another volley from the navy. At H-Hour (H-Hour was scheduled for 9:00 a.m.; the first assault wave of armored tracked landing vehicles began landing at 8:59 a.m.), the first of 30,000 marines to land that day struck the beaches. The Marines encountered only light fire near the shore but where bogged down with the island’s black volcanic ash that stuck to everything. The loose ash prevented good footing and the digging of foxholes. As the Marines moved in land the Japanese opened up from their fortified positions. With no cover US forces were mowed down by hidden positions placed to give deadly interlocking fire. The fighting was bitter and the Americans took heavy causalities. Marines rarely had a target as the Japanese fought from their immense system of bunkers and tunnels. Often a bunker or pill box would be declared safe only to have it open fire again when Japanese occupied the guns again via their tunnel systems. After four days of brutal fighting marines had fought their way to the base of the volcano when CO of 2nd Battalion, 28th Marines, Lt. Colonel Chandler Johnson sent down the word to take the summit of Mt Suribachi. Earlier, a four-man patrol lead by Sgt. Sherman Watson had climbed the hill with no resistance and reported no Japanese presence at the top in the crater. Executive Officer, Lt. Shrier was selected to lead an attacking force to the top of the volcano. The patrol had about 40 men, mostly made up of elements from the 2d Battalion, 28th Marines, 5th Marine Division E Company and some of F Company. Before he left Johnson handed Shrier an American flag and told him to take it with him and if possible put it up. Johnson’s adjutant, second lieutenant Greeley Wells, had taken the 54-by-28 inch (137-by-71 cm) American flag from their transport ship, the USS Missoula (APA-211). Lowery's picture of the first flag raising. 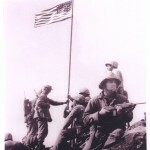 It is usually captioned as: 1st Lt. Harold G. Schrier with Platoon Sergeant Ernest I. Thomas, Jr. (both seated), PFC James Michels (in foreground with rifle), Sergeant Henry O. Hansen (standing, wearing soft cap), Corporal Charles W. Lindberg (standing, extreme right), on Mount Suribachi at the first flag raising. However, PFC Raymond Jacobs has offered some compelling evidence that disputes these identifications and insists that it caption should read: Pfc James Robeson (lower left corner), Lt. Harold Schrier (sitting behind my legs), Pfc Raymond Jacobs (carrying radio), Sgt. Henry Hansen (cloth cap), unknown (lower hand on pole), Sgt Ernest Thomas (back to camera), Phm2c John Bradley (helmet above Thomas), Pfc James Michels (with carbine), Cpl Charles Lindberg (above Michels). The climb up the hill was tough because of the loose ash, which was made even deeper from the naval, artillery and aerial bombardment. However, there was no Japanese resistance, some speculate that the Japanese where still in their bunker system awaiting more bombing runs. When the patrol reached the top of the mountain a quick search determined there was no enemy visible, and Lt. Shrier set up a defensive perimeter around the volcano crater. The men were able to find a water pipe that the Japanese had used before it became punctured by shrapnel. By digging a hole and then taking turns pushing the improvised, water pipe, flagpole down into the ground the stars and stripes was raised on Suribachi’s summit at 10:37, Feb 23. Lowery’s picture of the first flag raising. It is usually captioned as: 1st Lt. Harold G. Schrier with Platoon Sergeant Ernest I. Thomas, Jr. (both seated), PFC James Michels (in foreground with rifle), Sergeant Henry O. Hansen (standing, wearing soft cap), Corporal Charles W. Lindberg (standing, extreme right), on Mount Suribachi at the first flag raising. However, PFC Raymond Jacobs has offered some compelling evidence that disputes these identifications and insists that it caption should read: Pfc James Robeson (lower left corner), Lt. Harold Schrier (sitting behind my legs), Pfc Raymond Jacobs (carrying radio), Sgt. Henry Hansen (cloth cap), unknown (lower hand on pole), Sgt Ernest Thomas (back to camera), Phm2c John Bradley (helmet above Thomas), Pfc James Michels (with carbine), Cpl Charles Lindberg (above Michels). This was the first raising of the flag on the volcano mountaintop and not the raising captured in the famous Rosenthal’s picture. The flag raising on Iwo Jima were the first time American flags had been raised on Japanese soil in conquest. (A number of flags were raised on Iwo Jima; including: one at the base of Suribachi, two on the volcano summit, and one on Hill 165). Seconds after the flag went up marines across the island, still in combat, let out a huge roar. The screaming and cheering went on for some minutes and was so loud that the men could hear it quite clearly all the way from the top of Suribachi. The spontaneous celebration got even louder when the boats on the beach, and the ships at sea joined in with blowing horns and whistles. Unfortunately the celebration alerted Japanese soldiers in underground positions to the marine’s presence on the top of the volcano. Japanese soldiers used grenade attacks and rifle fire from caves and bunkers on the volcano rim to attack the flag raisers. Marines responded with flamethrowers, grenades, BAR and rifle fire. An intense but brief firefight ensued with the Japanese threat quickly suppressed and the caves cleared. In fact in one cave we counted 142 Japs. And the flame throwers did a fine job on top of the mountain. We tried to talk them out. They wouldn’t come out, so then we used the flame throwers as a last resort. There were no American causalities in this action except for Sgt. Lou Lowery’s camera. Lowery was a photographer for Leatherneck magazine. The broken camera was the same that had captured the raising of the first flag, but the film was still able to be developed. As Sgt. Lou Lowery hiked back down the hill to find another camera, he ran into three other reporters who where hiking Suribachi in hopes of capturing the flag raising. Lowery gave them the bad news that they missed it but said the climb was worth it for the view. The three were AP photographer Joe Rosenthal, cinematographer Staff Sgt. Bill Genaust, and Pfc. Bob Campbell also shooting still pictures. Following Lowery’s advice the three decided to finish the climb to the top. I thought of trying to get a shot of the two flags, one coming down and the other going up, but although this turned out to be a picture Bob Campbell got, I couldn’t line it up. Then I decided to get just the one flag going up, and I backed off about 35 feet. Here the ground sloped down toward the center of the volcanic crater, and I found that the ground line was in my way. I put my Speed Graphic down and quickly piled up some stones and a Jap sandbag to raise me about two feet (I am only 5 feet 5 inches tall) and I picked up the camera and climbed up on the pile. I decided on a lens setting between f-8 and f-11, and set the speed at 1-400th of a second. At this point, 1st Lt. Harold G. Shrier … stepped between me and the men getting ready to raise the flag. When he moved away, Genaust came across in front of me with his movie camera and then took a position about three feet to my right. ‘I’m not in your way, Joe?’ he called. Out of the corner of my eye, as I had turned toward Genaust, I had seen the men start the flag up. I swung my camera, and shot the scene. Army photographers rarely knew what they had captured with their shot’s and Rosenthal had no inkling of what he had taken. To make sure he had something worth the climb, he gathered all the Marines on the summit together for a triumphant shot under the flag. It was this shot that would become known as the “gung-ho” picture. When AP wired him with congratulations on a great shot Rosenthal assumed that they were referring to his “gung-ho” picture. He didn’t see the flag raising picture until he was shown a print at the press pool in Guam on March 9. It was here that Rosenthal was asked if he had posed the shot. Thinking that the man was talking about the “gung ho” shot Rosenthal replied that yes he had, “Yes, yes, I had to work on them, as a matter of fact, to get up there because they were all tired and dirty and they were still aware that there were caves around and there were occasional pistol and gunshots into the cave openings.” A passing reporter overheard this, and also assumed that Rosenthal was talking about the flag raising shot. 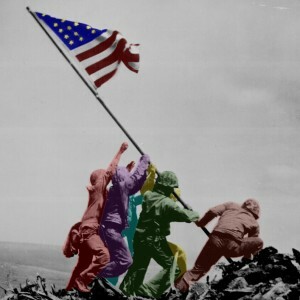 The rumor circulated and soon reached America when Time magazine’s radio show, “Time Views the News,” put on air a report that Rosenthal climbed Suribachi after the flag had already been planted and then had the marines replant it in a more dramatic pose. AP and Rosenthal were able to get Time to retract the story within days and issue an apology to Rosenthal but the rumor that he staged the photo would never die. It didn’t help that the Marine Corps glossed over that the first flag-raising had taken place. Historians, Albee and Freeman in their book, Shadow of Suribachi, state that from early 1945 to September 1947, General Vandegrift laid down a policy that suppressed recognition of any pictures taken at Iwo Jima that might diminish the Rosenthal shot. 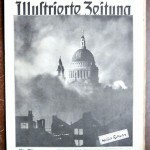 Thus Vandegrift ruled that Leatherneck magazine could not publish any of the shots that Lowery took of the first flag raising. 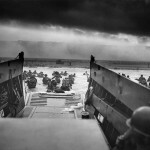 It wasn’t until 1947 that Lowery was able to publish and get credit for taking the pictures he shot. The man most responsible for the staged stage story Time-Life correspondent Robert Sherrod admitted that he was wrong a long time ago yet the rumor has staying power. 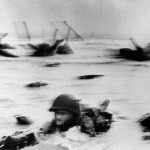 Even with all the info was released by the military in 1991 a New York Times story suggested that the Pulitzer Prize committee consider revoking Rosenthal’s 1945 award for photography. Then four years later columnist Jack Anderson promised an expose that Rosenthal had “accompanied a handpicked group of men for a staged flag raising hours after the original event.” He later backed down and admitted he too was wrong. Yet the posed story persists rearing its head every few years. 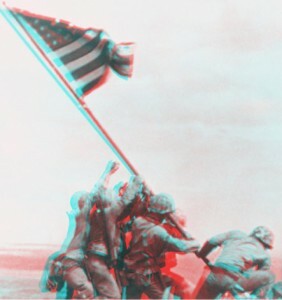 If you have 3-D glasses you can view this 3D image. When Rosenthal clicked the button on his camera and took his famous picture he was standing next to Marine cinematographer Sgt. Bill Genaust. Genaust filmed the flag raising and not only does the film clip that Genaust took prove that the Rosenthal shot was spontaneous but it is shot at almost the same angle, height, and distance as the Rosenthal shot. In fact a single frame is almost exactly the same as the famous flag raising. The slight difference of the two pictures make for an interesting effect: By juxtaposing Rosenthal’s photograph with a picture made from Genaust’s single frame of the same scene you can create a 3-D image of the one of the most, if not the most famous moments in American military history. 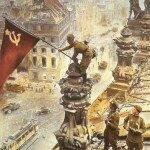 Twelve people raised the flag two separate times on February 23, 1945. Of the twelve, six were killed during fighting on Iwo Jima. Not counting the six killed, four were wounded, that’s ten out of the twelve listed as causalities (wounded or killed). Also, two of the twelve were Native Americans. Louis Charlo was born on September 26, 1926, in Missoula, Montana. A Flathead Indian, Charlo was a great-grandson of Salish Chief Charlo. He was one of men in Sgt. Watson’s 4 man F Company patrol which made the first climb up Suribachi. Charlo died on Iwo Jima on March 2, 1945, shot in the head by a Japanese sniper. Thomas was born on March 10, 1924, in Tampa, Florida. Sergeant Ernest was the Platoon Sergeant, a Staff Noncommissioned Officer rank above that of sergeant and was only below Lieutenant Shrier. Thomas was killed on March 3, 1945. On March 1, 1945 Hansen took a bullet and died in John Bradley’s arms. Michels was 27 years old man of German blood who was born in Chicago, IL. He was one of only four marines of the 3rd platoon, the platoon that first scaled Suribachi, that left the island untouched. He can be seen in the foreground with machine gun in Lowery’s image of the first flag raising. When he returned to America he got married and had four daughters. 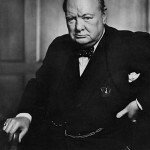 He died on January 17, 1982. Lindberg was the marine who had to climb Mt Suribachi with a 72-pound flame-thrower strapped to his back. He would later remark, “Suribachi was easy to take; it was getting there that was so hard!” Lindberg himself would be shot through the stomach and arm a week later on 1 March, 1945. For his heroism Lindberg would receive the Purple Heart and Silver Star Medal. Lindberg was the last official remaining man alive of the twelve who raised a flag on Mount Suribachi. He was wounded six days later and was awarded the U.S. Navy’s third highest award, the Silver Star. He died on June 24, 2007. Schrier led the patrol up Mt. Suribachi, where he and his men raised a small (54″ X 28″) American flag. He was later awarded the Silver Star for leading the defense against a fanatical Japanese attack. After the war Schrier remained in the service and saw action again in Korea. He retired as Lieutenant Colonel and moved to Bradenton, Florida where he died on June 3, 1971. He is buried in Mansion Memorial Park, Ellerton, Florida. Harlon Block was born on November 6, 1924 in Yorktown, Texas. When the picture of the second raising first came out, Block was misidentified as Harry Hansen. (To make things more confusing Harry Hansen is one of the men who raised the first flag) On Feb. 25, when Harlon’s mother, saw the picture in the Weslaco Newspaper she declared, “That’s Harlon” pointing to the figure on the far right. Belle never wavered in her belief that it was Harlon insisting, “I know my boy.” It wasn’t until a Congressional investigation 18 months later and the testimony of Ira Hayes that Harlon Block not, Hansen was acknowledged as the one of the six. On 1 March, Block took over the squad after Sergeant Strank was killed. A few hours later, a mortar shell riped him open from groin to neck. John Bradley later recounted how Block screamed, “They killed me!” as his intestines spilled onto the volcanic ash. Block is buried beside the Iwo Jima Monument in Harlingen, Texas. John Bradley will be forever memorialized for a few moments action at the top of a remote Pacific mountain. We prefer to remember him for his life. If the famous flag-raising at Iwo Jima symbolized American patriotism and valor, Bradley’s quiet, modest nature and philanthropic efforts shine as an example of the best of small town American values. Rene Gagnon was born on March 7, 1925 in Manchester, New Hampshire. He was part of the four-man team who carried the second flag to the top of Mount Suribachi. It was Gagnon that when using an enlarged Rosenthal photo he identified the other five wrongly naming Harlon Block as Harry Hansen. When President Franklin D. Roosevelt brought the surviving flag raisers home Gagnon was the first to arrive. At first, Gagnon refused to give the name of the sixth flag raiser insisting that he had promised to keep the man’s name a secret. Finally, Gagnon named the sixth raiser as Private First Class Ira H. Hayes. Of the three survivors Gagnon loved the celebrity, and the perks it brought. However like Bradley and Hayes, he did not call himself a hero. Gagnon died of a heart attack on October 12, 1979, and his gravestone is the only tablet with an inscription and a brass bas-relief of the famous picture on the back. Ira Hayes was born on January 12, 1923 in Sacaton, Arizona. Ira was a Pima Indian and when he joined the marines his chief told him to be a Honorable Warrior. Ira always struggled with his fame and couldn’t get over his guilt of how many friends had died while he had lived. When reporters asked him how it felt to be a hero he replied, “How can I feel like a hero when 250 of my buddies hit the island with me and only 27 of us walked off alive?” Ira fought a constant battle with his war memories and heavily medicated himself with alcohol. When asked about his problems with alcohol Hayes said, “I was sick. I guess I was about to crack up thinking about all my good buddies. They were better men than me and they’re not coming back. Much less back to the White House, like me.” After the war, Hayes accumulated some fifty arrests for drunkenness and on January 24, 1955, Hayes was found dead on the Gila River Indian Reservation. He had been drinking and playing cards with several other men, including his brothers Kenny and Vernon, and another fellow Pima named Henry Setoyant. The coroner concluded that Hayes’ death was due to exposure and too much alcohol. However, his brother Kenny remained convinced that it somehow resulted from a scuffle with Setoyant. Ira Hayes story has always attracted a lot of attention and is immortalized in a song, “The Ballad of Ira Hayes,” by Peter LaFarge and performed by Johnny Cash and later Bob Dylan. Before he died Ira was in two movies staring as himself raising the flag at Iwo Jima. There has even been a movie made about his life called, The Outsider (1961) and starring Tony Curtis. Franklin Sousley was born on Sept. 19, 1925 in Hilltop, Kentucky.He was raised on a small farm growing tobacco. In what can be described as a “hillbilly” life Frank attended a two room school house and was know as a practical joker. His best friend in Hilltop talks about Franks antics, “Yeah, you know, we took two cows up on the porch of the Hilltop General Store. Then we strung wire across the stairs so the cows couldn’t get down. Then we fed them Epson salts. Those cows crapped all night.”Sousley was the last of the three to die on Iwo Jima Almost a month after raising the flag, on March 21, he was shot in the back by a sniper at Iwo Jima. When someone shouted, “How ya doin’?” Sousley replied, “Not bad. I don’t feel anything.” Then he fell and died. The telegram that reported the death was delivered to the Hilltop general store. After his mother found out, neighbors from across all around could hear her screaming. Born on 10 November 1919 in Jarabenia, Czechoslovakia. Strank was known as the, “old man” because he was older, 25, than the other men, in his unit.Growing up Mike was blessed with a photographic memory, played the French Horn and had even hit a baseball out of Points Stadium. Strank had been in the Marines since he enlisted in Pittsburgh on 6 October 1939 but was only with the company E for a few months. Even though he had a short time with the men Strank was looked up to by his unit and by all accounts was a great leader. Before Iwo Jima Mike’s superior had tried to promote him, he turned it down saying, “I trained those boys and I’m going to be with them in battle.” On March 1, shrapnel ripped out Strank’s heart killing him instantly. 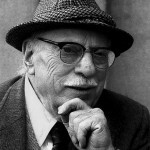 AP Photographer Joe Rosenthal was born on 9th October, 1911 in Washington, DC. He always loved photography and after finishing college became a staff photographer with the San Francisco Examiner.After Pearl Harbor and America joined the war Rosenthal tried to join the US Army as a military photographer but was rejected due to poor eyesight. He was able to find another way in the war by getting a job as an AP Photographer. Rosenthal was on the beaches since Feb 19th (lugging his bulky 4×5 Speed Graphic camera which is now housed in the George Eastman House museum) and took a total of 65 pictures over 11 days on Iwo Jima. Even though he took a number of dramatic shots before and after the flag raising, yet will always be remembered for his famous shot. 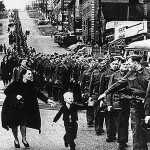 In 1945, the picture won the Pulitzer Prize. 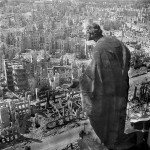 After the war, Rosenthal became chief photographer and manager of Times Wide World Photos. Later he worked for the San Francisco Chronicle with fellow cameraman, Bob Campbell, the same photographer who hiked Suribachi with him. On August 20, 2006, at the ripe old age of 94, Rosenthal died of natural causes in his sleep in Novato, a suburb of San Francisco. Genaust shot a historic color movie of the raising of the second flag with a hand-held Bell & Howell motion picture camera loaded with slow (8 ASA) 16 mm Kodachrome film. Before Iwo Jima, Genaust saw action in Saipan where he was forced to put down his camera and use his gun to fend off a Japanese charge, taking a bullet in the thigh. For this action he was recommended for a medal. Nine days after the filming Genaust was killed by Japanese soldiers in the caves on Hill 362A. He was 38 and left behind a wife of 17 years. The cave entrance was brought down by explosives and then later sealed by bulldozers. After Iwo Jima was secured and bodies all over the island were being recovered, the cave was determined to be to dangerous due to explosives. Over time, the cave entrance has been lost and his body was never recovered. Although his film clip was used extensively, Genaust was not publicly identified by the Marine Corps or given credit. It took a decades long campaign by fellow Iwo Jima survivor Sgt. Harrold Weinberger to honor Genaust. Finally in 1995, a plaque was placed atop Suribachi saying:SGT. WILLIAM HOMER GENAUST. MARINE COMBAT CAMERAMAN. SHOT HISTORIC MOVIE OF FLAG RAISING. WON BRONZE STAR. KILLED IN ACTION, MAR. 4, 1945. AGE 38. In June of 2007 a team of experts was sent to Iwo To (The Island was renamed in 2007 to its pre-war name) in search of Genaust’s remains. They identified two caves on Hill 362A that could hold his remains but were blocked from entering out of fear of unexploded ordnance and cave-in dangers. The team sent their finding to the Joint POW/MIA Accounting Command (JPAC) research center which is dedicated to finding American service men’s remains around the world. The JPAC team will hopefully do a follow up investigation to search the newly discovered tunnels. The JPAC team was able to discover the caves thank to another investigation lead by American businessman Bob Bolus. Bolus spent thousands of dollars of his own money to track down new leads after reading about Genaust’s fate in 2005. However when the men returned in 2007 they did not find the remains of Genaust or anyone else. Another trip was sent in 2008 but it to ended in failure. Later in 2008 Mr Bolus came across Gareth Rosson, an Army veteran from Canton, Ill., who was stationed on Iwo Jima after the war. Rosson remembers that a memorial was set up while he was there showing that while Genaust was buried on Hill 362A it was on the north slope, not the southwest side where the earlier search was centered. Bolus is attempting to convince the Japanese government to allow another trip to the island. 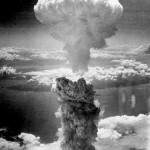 on the morning of February 23, 1945. Just after 11:15 a.m., a helmeted young Marine with dark sideburns came aboard LST-758 … requesting the flag … Resnick recalls climbing the 10-foot steel ladder to the signal bridge. Rummaging around in the wooden bunting box, he worked his way toward the bottom and felt a large flag, still folded. Gagnon then asked for a 20-30 foot pipe … he was given a 21-foot galvanized steel steamfitter’s pipe. It weighed more than 150 pounds, Resnick said. Gagnon slung it over his left shoulder, tucked Resnick’s flag under his right arm, and headed up the volcano as Resnick stood on the deck watching history unfold. Resnick said it was probably a 20-minute journey. “There was a whooping and hollering — a tremendous cheer as the flag went up,” said Resnick. “Every ship tooted its horn,” he said. “The memory is very clear and compounded by great sentiment and great apprehension as I recall the sites of death,” said Resnick. In the run up to the war small American factories made the US flags that flew from ships, military bases, funeral services, etc. One of these little plants was the “flag loft” at the Mare Island Naval Shipyard in Vallejo California. There one lady, Mrs. Mabel Sauvageau, made flags and battlejackets for the men. There were about 100 girls on each shift and I did the assembling, stitching the flags and putting the stars and stripes together. They told me the flag had my number on it — 320 — I remember that, We packed the flags in bundles of 10 and the 10th flag on top had the number on it. If it had been one of the other flags, I never would have known. Her number, 320, was discovered on the second flag that was raised on Iwo jima and whose image was captured by Rosenthal. 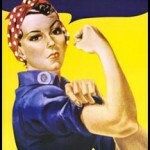 The Navy was able to track Mabel Sauvageau down to her factory and tell her not to soon after the flag raising that the famous flag was one she made. Sauvageau remembers that, “At the time, I didn’t think too much of it, but I guess anybody would feel proud.” In the early 70’s the military again tracked her down to present her with a framed picture of the raising autographed by Rosenthal. The Rosenthal shot was famous almost right away but what would make probably the most reprinted military picture ever was the 1945 7th bond tour. During World War II the American government paid for the war effort by selling bonds to the US public. By 1945 there had been six “Bond Tours”. The tours were big showy events with Hollywood stars, music, and stadium appearances all designed to sell bonds. 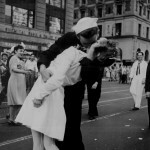 When the flag raising picture started appearing on all the major newspapers FDR knew he had a symbol for the next tour. One million Retail Store windows. With Bradley, Hayes and Gagnon in tow, the 7th Bond Tour raised $24 Billion (1945 Dollars) for the US war effort. Considering that the US budget for 1946 was 56 billion this was quite an achievement. In addition to posters and other reproductions of the image in July 1945, the United States Post Office also released a postage stamp of the shot. Making it one of the few times that the US post office has released a stamp with images of living people. From the initial landing on February 19 the battle raged on with marines slowly, and at great cost, pushing the entrenched Japanese fighters further and further into the northern corner of the island. Finally on the night of March 25 almost after a month of fighting the surviving Japanese forces launched a final counterattack with a 300-man banzai charge near Airfield Number 2. This final Japanese attack lasted until the morning with the elimination of the entire Japanese attacking force. The island was declared, “secure” the following day. Even though the island was declared secure on March 25, about 2000 soldiers hid out in the islands vast tunnel system. Most of these surrendered in the months that followed but two men Yamakage Kufuku and Matsudo Linsoki, lasted four years, only surrendering in 1949. They had been surviving by stealing American supplies and only surrendered when they heard Christmas carols from a Tokyo radio station on a stolen American radio. They reasoned that the only way Christmas carols would be allowed to play in the Japanese capital was if Japan had lost the war. Two days after the Rosenthal shot hit the papers US senators called for a national monument of the flag raising. A talented sculptor Felix DeWeldon had a clay replica of ready within 72 hours of seeing the picture. Soon he was visiting the White House with his replica and plans of building the tallest bronze statue in the world. However, it would take 8 years to create the Iwo Jima Monument. First a plaster was created using the Rosenthal shot, and the three survivors of the flag raising as models. Pictures and physical stats were used for the three men who had made the ultimate sacrifice on Iwo Jima. Once a plaster of the statue was completed it was disassembled and taken to Brooklyn, N.Y for casting. The casting took almost three years to complete. Again the pieces were trucked to Washington, D.C. by a three-truck convoy. About 12 pieces were reassembled, the largest weighed more than 20 tons, at the memorials resting place in Virginia, next to Arlington Cemetery. The memorial was designed to be aligned almost perfectly with the National Mall, the Lincoln Memorial, Washington Monument and the Capitol dome. After being bolted, welded and sprayed with a finish, the statue was officially dedicated by President Eisenhower on November 10, 1954, the 179th anniversary of the U.S. Marine Corps. The tallest marine is about 32 feet high. The flagpole itself is 60 feet in length. At 78 feet high it’s the world’s tallest bronze statue. The sculpture’s $850,000 pricetag (1954 Dollars) was picked up by private donations, mostly other marines. My wife, Linda, and I are SO happy to read to the story about “LST-758 or LST-779” because it gives GREAT CREDENCE to the story that my wife’s grandfather had told her, and many others before he passed away in 1986, about MAKING the second flagpole that was on LST-758 according the recollections of Robert L. Resnick, now 82, a Coast Guard veteran and quartermaster on LST-758. My wife’s Maternal Grandfather was Orval Ellwood Books, Ship Fitter, First Class (T), a Master Welder (both in civilian life, as well as in the Navy) on board the USS Hamlin, AV-15, during the battle for Iwo Jima. He related the story this way; he was told by a crew member that he had a call from General ?? ?, on the island, who wanted to speak to the Master Welder right away. When Orval took the call, a gruff angry voice identified himself (no further information on the name of the General is remembered, but I suspect it was General “Howling Mad” Smith). The General then said ” Mr. Books, this is General ?? ?, what do you have that you can build a flagpole out of? Mr. Books replied, “I have flue pipe, Sir!”. The General then said something to the effect of, “I want you to weld enough damn pipe together to make a flagpole tall enough that this flag can be seen by every Jap, in every hole, from everywhere on this whole Goddamn Island!” In relating the story, Grandpa Books went on to say that when the flag pole was finished, it was very heavy and was taken topside. From there it was loaded on to a landing craft, to go ashore, apparently to the beached LST-758, where it would be picked up. Orval Books was a very honest and ethical man, and my wife personally heard him share this account with other people many times. He was not the type to brag on himself, and only related this account, as part of his answer, when someone would ask if he had served in the War. 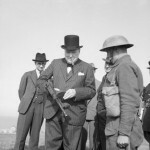 He somewhat felt as though ” he was just doing his job”, but yet he also knew, and was immensely proud of, his “behind the scenes” contribution to what eventually became a national icon of the Second World War. He was incredibly proud of his Naval service. It has been very frustrating to hear his story and then later discover that everyone simply attributed to appearance of the SECOND flagpole to “more” Japanese irrigation pipe. The account given by Robert Resnick, who was a witness to the events, is the FIRST and ONLY KNOWN account that clearly, and independently, provides great credibility to another part of the Iwo Jima story that has been lost for decades. Of course, the Ship’s Log, Comm Log, or the shipfitters log that was aboard the USS Hamlin are most likely stored in the Naval Archives and could be examined to see WHO, or IF, someone called from shore that day to ask for someone who could build a flagpole. If this data could be confirmed through the Hamlin’s official log books, a whole new chapter could be added to the Navy/Marine Corps story, correcting a decades old erroneous historical assumption and, bringing with it, a greater depth and richness to the whole Flag Raising story of Iwo Jima! WHEN MY BROTHER CAME HOME FROM WORLD WAR II, HE TOLD ME THAT HE HELPED PUT UP THE FLAG ON IWO JIMO. I WAS HOPING TO FIND SOMEONE TO COLLABORATE THIS. HIS NAME WAS LEWIS THOMAS LOOSE. I WILL LEAVE MY EMAIL ADDRESS BELOW.